Probax is pleased to announce it has been awarded with the first annual Innovation Award by Veeam at VeeamON 2018 in Chicago, IL, USA. Probax’s Honeycomb VTL (Virtual Tape Library / Archive-as-a-Service) is recognised as a forward-thinking and innovative solution which provides automatic archiving of GFS restore points, including air-gapping and minimum expiry times. As Probax expands its footprint globally as part of its growth strategy, this award recognises key innovators globally for delivering powerful solutions that leverage the open APIs and orchestration mechanisms of the Veeam Hyper-Availability Platform to deliver innovative solutions at scale and that drive business outcomes for enterprises across the globe. "We are incredibly honoured to be receiving an innovation award from Veeam, a company which itself continues to be the leading innovator for data protection and availability,” said Kevin Allan, Probax Founder and CTO. “Our long-standing partnership with Veeam is an example of true collaboration and it has supported our global business growth exponentially." Veeam is the global leader in Intelligent Data Management for the Hyper-Available Enterprise. Veeam Hyper-Availability Platform is the most complete solution to help customers on the journey to automating data management and ensuring the Hyper-Availability of data. For more information, please refer to our media release. 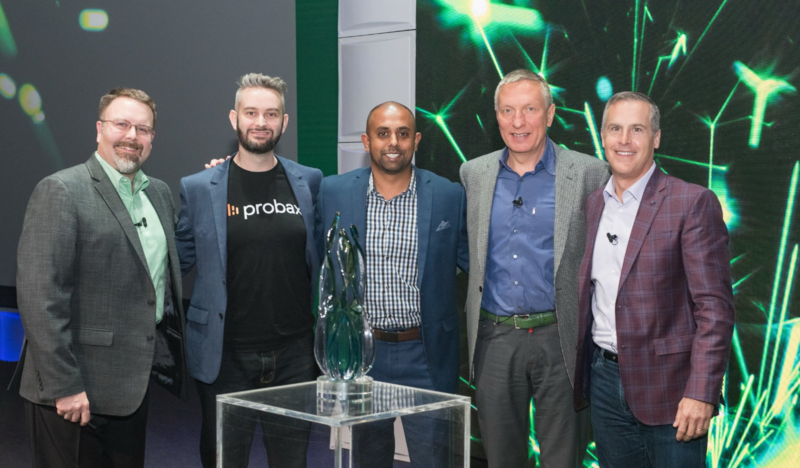 Pictured in the photo above are: Veeam Sr. Director, Product Strategy Jason Buffington, Probax Founder & CTO Kevin Allan, Probax CEO Sam Meegahage, Veeam Co-founder Ratmir Timashev and Veeam Co-CEO and President Peter McKay.